Elastic waves can be used for quantitative non-destructive evaluation, with the goal of detecting elastic inhomogeneities including defects, determination of material properties, and for the study of high rate loading of solids. Elastic waves can be generated using photoacoustics techniques. These techniques use pulsed lasers for the generation of high frequency elastic waves, which are detected after propagating through a sample by monitoring the transient motion of the sample surface using a local optical probe. In this talk, I would present our efforts to understand the propagation of elastic waves in solids with depth dependent elastic properties. Furthermore, I would discuss our recent progress in combining atomic force microscopy with photoacoustic techniques, in order to produce a nanoscale probe for local and time-resolved detection of elastic waves, photoacoustic imaging of subsurface inhomogeneities, and optical readout of vibrations in nanomechanical resonators. 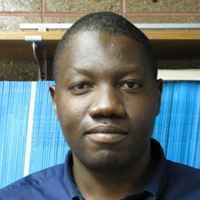 Oluwaseyi Balogun is an Assistant Professor in the Departments of Mechanical Engineering, and Civil and Environmental Engineering, at Northwestern University. He received the B.Sc degree from the University of Lagos, Nigeria in 1998, and MS and PhD degrees in Mechanical Engineering from Boston University in 2003 and 2006. He held postdoctoral fellow positions at The Johns Hopkins University from 2006-2007 and at Northwestern University from 2007-2008. He joined the Northwestern University faculty in 2008, where he and his group develop laser based experimental mechanics techniques to study a range of problems in solid mechanics, including dynamic deformation of materials, super-resolution photoacoustic imaging of subsurface structures, elastic wave propagation in functionally graded solids, and optical characterization of nanomechanical resonators. He is a member of several professional societies including ASME, and IEEE UFFC, and the Acoustic Society of America, and he has held a visiting position at the Lawrence Livermore National Laboratory in California.